Yes folks, our main character is called Amy and she's a girl. The sprite design has gone through a long history. For most of its life, it was intended for use in a PC Engine game and began as the concept sprite below. Then followed a bit of animation testing. I then spent some time completely re-imagining her in a cute style, to match the feel of the Bonk/PC Genjin sprite on the TG-16/PC Engine. This one I'm still quite happy with, maybe I can use her someday. When Grelox finally became a real 'thing' I forgot the old Amy and tried some experiments that didn't get very far. You can see from the roughs below that I was trying to get some kind of helmet design that was unusual and unique, but it just wasn't working. So, as I should have done to start with, I sketched out a proper concept for her suit, which drew heavily from the old Amy with some cyberpunk influences. This led to a taller sprite which just didn't look right. So I squished her down and somehow it all clicked into place. Amy was born. I both like and hate designing logos. The end result can be quite rewarding, but too often you spend hours just scrolling through pages of fonts looking for something that jumps out at you. Which is what happened with Grelox, and by the end I was bored and no nearer to discovering that truly perfect font. So I gave up and decided to draw it out manually. In my head I wanted the logo to harken back to the 80s, much as the game itself does. I had a look at some Heavy Metal album covers for inspiration and also always had something like Robocop on my mind, as I love that classic look. So, not being too skilled at curves, I drew out some straight edged lettering in Illustrator, then took it into Photoshop for some time consuming work, all to make it look intentionally dated. What I ended up with was a nice bevelled logo that looked straight out of a 1980's Spectrum game advert. 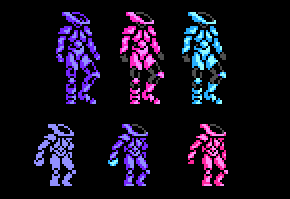 And with some consultation with Andrew on colour variations, we finally settled on the deep purple and pink, matching our main character's outfit perfectly. And you can see a bigger version on the Grelox page on Aetherbyte HERE where I think it looks a bit nicer. 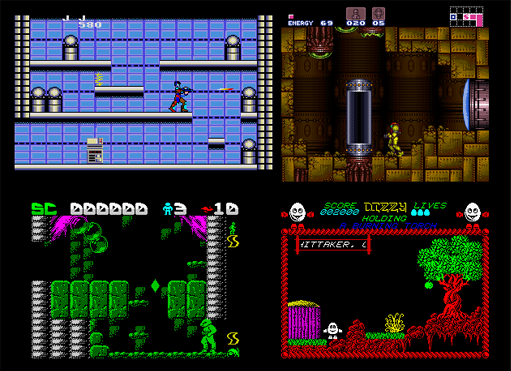 The genesis of Grelox was in early 2011 when I wanted to do a Metroidvania style game for the PC Engine/TurboGrafx-16. Like most people, I found Super Metroid and Castlevania: Symphony of the Night truly influential when they were released and they still mark a pinnacle of a certain type of game design. However, it soon became apparent that this would be quite a difficult and lengthy project, especially given the very limited time that homebrew developers have to spend (and on top of that there were many other games that were already waiting in the queue to be made). While programming on other projects was underway, I began messing around with some sci-fi based graphics for fun, which eventually led on to a more straightforward platformer design. I envisioned a futuristic Bonk's Adventure/PC Genjin where, as well as completing levels in a linear fashion, you could have several optional goals (like the Mario-esque collecting 5 red coins or finding particularly tricky hidden objects buried in the maps). It would also involve levels having multiple paths - one normal and one a real challenge. All this was considered to increase replay value and longevity. This idea sat stewing for some time. After going back and playing some old 8-bit titles like Draconus, I went back to my Metroidvania idea, but with the focus on a designing a game for a short development period. This project, which for the moment must remain secret, had a more dark, fantasy tone - meant as a companion to Aetherbyte's MSX platformer Inferno. Without compromising fun, I had to look at this from the programming standpoint. Cutting out things like attacks, complex enemy AI and even scrolling could mean cutting the development time significantly. But development on old hardware can be painfully slow, and even so it could be another few years before we could get our teeth into this game. With Andrew learning the ropes in Unity, we decided it was worth leapfrogging the project over to the PC - taking the best core elements from the game design (such as the puzzle system), the original sci-fi theme and adding more action and adventure. The flexibility of PC development means that we can still create a retro themed action adventure, but we can now do it quicker and with more flair and deliver a far more compelling finished game. I'm really excited for our plans. LATEST DEVELOPMENT STATUS: Basic mapping is pretty much done. Working on art for the initial rooms. I plan make simple, block-layout maps for most of the rooms so we can have something to test the room design before dropping in finished graphics. So what this boils down to is a classic-style action adventure (with some puzzles to be solved). Gameplay will take place on a large map, with each screen representing a room to be navigated and explored. The game is not linear, but will require you to seek out both new and old rooms to complete your tasks. There will be items to pick up and use, as well as a variety of power-ups that may help you access new areas. That's all I'm willing to give away for now - I'm currently working on the master map for the game and trying to pin down the best locations for items, bosses and power-ups. For the first entry in this blog, I felt it best to start off with a new announcement. If not, don't worry. All it means is that we are working on a retro-styled game for the PC. The game is called Grelox and through this blog I hope to share insights on the development from the early stages to completion. I am primarily drawing the art, writing the story, designing the maps and gameplay - the programming, music, sounds and further design will be done by Aetherbyte's founder, Andrew (AKA Arkhan). Grelox is an arcade-adventure and is in the very early stages of design (in some respects - from another point of view it has been in planning for years, but more on that later) but hopefully soon I will be able to share more details of gameplay and some initial graphics. It's being programmed in Unity which offers us greater flexibility than we are used to and also means progress should be a lot faster than our other projects. If you want to keep up to date with news, subscribe to this blog or follow me on Twitter (@sunteam) or Facebook where I will post new blog entries as they become available. In the meantime, welcome to the blog and here's a preview of Grelox's main sprite to get things started.